(l-r) Dr. Shivan Haran, Bradon Cole (middle), Collin McCrary (right). This is A-State Connections on KASU. I’m Johnathan Reaves. This is the weekly segment called “A-State Connections and Create@State: Making Connections That Count”. In this interview, Professor of Mechanical Engineering at A-State Dr. Shivan Haran talks about two projects that showcase the mechanical engineering programs at A-State. Senior students Brandon Cole and Collin McCrary also join him for the interview about mechanical engineering. Click on the Listen button for the entire interview. 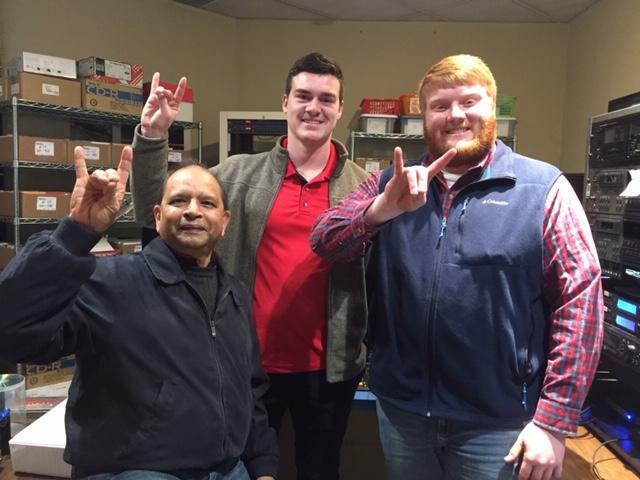 Professor of Mechanical Engineering at A-State Dr. Shivan Haran and senior students Brandon Cole and Collin McCrary on the Create@State podcast. To hear more interviews like this one, you can subscribe to the Create@ State Podcast at the Create@State podcast page on KASU.org. It is also available on iTunes or Google Play, or you can listen on the NPR app. Please tell others about the Create@State Podcast, also leave us a review. We would love to hear from you.